Despite the old adage that says you can’t wear white after Labor Day, at my Long Grove dental office, we think it’s always in style to wear a white smile. While habits and time itself can take a toll on your grin and make your pearly whites less than bright, there are some things you can try in order to get, and keep, your smile its ideal shade of white. 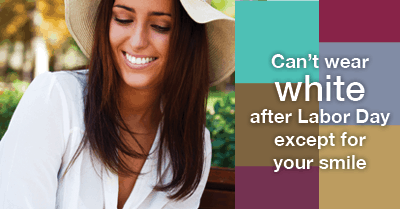 One of the best ways to get your smile bright and white is with a professional whitening from your Long Grove dentist. After all, these whitening treatments are stronger than what you can get in the store and the trays are often custom-fit to your teeth. A tight fit means there’s is less chance of the whitening solution reaching your gums and causing damage, and it can also help lead to an even white across all teeth. But a professional whitening is only one step you can take in creating a long-lasting white smile. After you get your teeth nice and white, it’s important that you strive to keep them that way. Some of the most common causes of a dull smile are found in what we eat. Just by avoiding the smile-fading foods and opting for less damaging choices, your whitening treatment will be sure to last longer. I addition to choosing more smile-friendly options, you can also help keep your teeth white by drinking any soda, tea, or coffee through a straw as it will help keep the ingredients away from your teeth; avoiding smoking; and always brushing and flossing. As always, one of the best ways to keep your smile not only white but also healthy and strong is to maintain regular visits to my dental office in Long Grove. Routine visits help catch any problems before they become worse, and we can even provide you with a little whitening boost if you need it at that time.